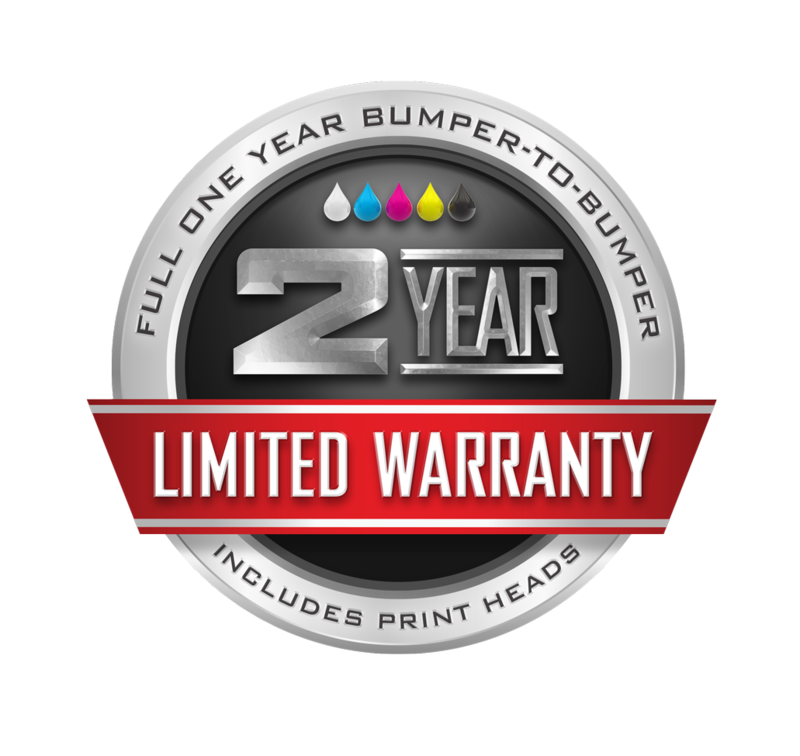 The Brother Bumper to Bumper Two-Year Limited Warranty.It’s more than a warranty, it’s a promise. This “bumper to bumper” limited warranty (“warranty”) is given only to the original end-use purchaser (referred to in this warranty as “Original Purchaser”) of the accompanying product (collectively referred to in this warranty as “this Product”). If you purchased a product from someone other than an authorized Brother reseller in the United States or if the product was used (including but not limited to floor models or refurbished product) prior to your purchase, you are not the Original Purchaser and the product that you purchased is not covered by this warranty. This Product includes the machine (the “Machine”) specified herein. This warranty applies only to Products purchased and used in the United States. For Products purchased in, but used outside, the United States, this warranty covers only warranty service within the United States (and does not include shipping outside the United States). Except as provided below, Brother International Corporation warrants to the Original Purchaser for a period of two (2) years from the date of installation, as evidenced by a signed installation form (“Installation”), that the solid state electronic components manufactured by Brother and included in the Machine equipment purchased from Brother, or an authorized Brother reseller, were delivered free from defects in materials and workmanship, excluding mechanical or electro- mechanical components including, but not limited to, switches, motors, and solenoids. The foregoing warranty is given only to the Original Purchaser which purchased the equipment (including the component(s) claimed to be defective) directly from Brother, or an authorized Brother reseller in the United States, and are not transferable. The Machine will have the following warranty of two (2) years or 24,000 prints from the date of Installation for the following: (i) parts, including, print heads, maintenance stations, wiper blades, tubes, rubber caps, cams, and belts; (i) electronic components, including, sensors, motors, solenoids, ribbon cables, circuit boards, micro switches, media readers, encoder, and fan; and (iii) solid parts of the chassis, including, frames, shafts, linear rails, bearings, gears (plastic and metal). Physical damage to this Product. Damage caused by improper Installation, improper or abnormal use, misuse, neglect or accident (including but not limited to transporting this Product without the proper preparation and/or packaging). Damage caused by another device or resulting from use of non-Brother brand parts and Consumable and Accessory Items (including but not limited to the use of non-Brother brand ink or solution, and cleaning kit products. Normal periodic maintenance items, including but not limited to, wiper cartridges, fan filter, and flashing foam. This warranty is VOID if this Product has been altered or modified in any way (including but not limited to attempted warranty repair without prior written authorization from Brother and/or alteration/removal of the serial number). The Product MUST NOT be transported without a Brother Representative, a Brother Authorized Distributor, or a Brother Certified Technician being consulted with and specific packing and shipping instructions must be strictly followed, otherwise, such transportation of the Product may VOID this warranty. Use of contaminated, inadequate or excessive amounts of lubricants. Improper storage or improper protection from climatic elements and vandalism. Accident, collision or other physical mishap or abuse, whether by Original Purchaser or any other party. Report your issue to Brother’s Customer Service Hotline at (877) 427-6843 within the applicable warranty period. Supply Brother with a copy of your dated bill of sale showing that this Product was purchased from an authorized Brother reseller within the United States. Send a component part of the Product properly packaged, freight prepaid, to Brother for inspection, together with a photocopy of your bill of sale. You are responsible for the cost of shipping, expedited shipping, packing product, and insurance (if you desire). You are also responsible for loss or damage to this Product and its component parts in shipping. Shipments must be made using a ground carrier that assigns tracking numbers to its shipments. Download and send Brother customer usage data to Brother for review via USB drive or another format agreed to by Brother. Permit a Brother representative to provide On-Site Warranty Service by providing access to this Product at reasonable times and by providing adequate working space, including heat, light, ventilation, electric current and outlets for use by the Brother representative, together with reasonable cooperation in troubleshooting to diagnose the problem. “On-Site Warranty Service” means remedial service during Normal Working Hours at your location to restore the Product to good operating condition under normal usage at no charge for parts and labor (or travel for the first 90 days after the date of Installation) and does not guarantee uninterrupted operation of the Product. Please note that you will be charged labor costs for the replacement of printed circuit boards. “Normal Working Hours” shall mean 9:00 A.M. to 7:30 P.M. Eastern Standard Time, Monday through Friday, excluding legal and local holidays observed by Brother. If the problem reported concerning your Machine is covered by the warranty and if you first reported the problem to Brother within the applicable warranty period, Brother will, at its option, either repair the component(s) or replace the component(s) with a functionally equivalent component(s), including a refurbished part(s) (or arrange for either). Brother reserves the right to supply a refurbished or remanufactured replacement Machine and/or part and use refurbished parts provided such replacement products conform to the manufacturer’s specifications for new product/parts. In the case of a component part, if you receive the replacement component part prior to your returning the defective component part, you will replace the defective component part(s) with the replacement component part(s) supplied by Brother and return any claimed defective component part(s) within thirty (30) days of receipt of the replacement component part(s) or pay Brother the list price for each such defective component part(s) not returned within 30 days after receipt of the replacement component part(s). In the case of a replacement Machine, if you receive the replacement Machine prior to your returning the defective Machine to Brother, you will return the claimed defective Machine to Brother within 30 days after receipt of the replacement Machine. Brother will require that you provide a valid major credit card number. Brother may issue a hold against the credit card account number that you provide until Brother receives your original Machine or component part(s) and determines that your original Machine or component part(s) is entitled to warranty coverage. Your credit card will be charged up to the cost of a new Machine or component part(s) only if: (i) you do not return your original Machine or component part(s) to Brother within thirty (30) days; (ii) the problems with your original Machine component part(s) are not covered by the limited warranty; (iii) the proper packaging instructions are not followed and has caused damage to this Product; or (iv) the warranty period on your original Product has expired or has not been sufficiently validated with a copy of the proof of purchase (bill of sale). If after you replace the defective or failed component(s), the reported problem has not been solved, Brother may determine, at its sole discretion, that On-Site Warranty Service is required or that you should send the component(s) to Brother for further inspection. If Brother determines that On-Site Warranty Service is required, you shall cooperate with Brother as described in the “What Brother Will Ask You to Do” section above. Please note that you will be solely responsible for all zone, hotel and travel expenses associated with Brother’s On-Site Warranty Service after the expiration of the limited warranty period described above. If the Machine is not covered by this warranty, you will be charged any shipping or travel costs incurred by Brother and charged for any service and/or replacement component parts at Brother’s then current published rates. Brother is not responsible for damage to or loss of any equipment, media, programs or data related to the use of this Product. Except for that repair or replacement as described above, Brother shall not be liable for any direct, indirect, incidental or consequential damages or specific relief. Because some states do not allow the exclusion or limitation of consequential or incidental damages, the above limitation may not apply to you. This warranty is the only warranty that Brother is giving for this Product. It is the final expression and the exclusive and only statement of Brother’s obligations to you. It replaces all other agreements and understandings that you may have with Brother or its representatives. This warranty (and Brother’s obligation to you) may not be changed in any way unless you and Brother sign the same piece of paper in which we (1) refer to this Product and your bill of sale date, (2) describe the change to this warranty and (3) agree to make that change.